Many people have been told that fat makes them fat, contributes to heart disease, and generally erodes their health. Now a growing body of research is debunking that, revealing the health and weight-loss benefits of a higher-fat diet rich in eggs, nuts, healthy oils, avocados, and other delicious super-foods. 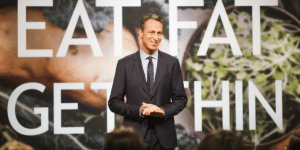 Dr. Mark Hyman introduces a new weight-loss and healthy living program based on the latest science and explains how eating fat can actually help promote optimum health. On CPTV: Thursday, November 30, 2017 at 9:30 p.m.